With the new vehicles currently being manufactured, Network Rail is yet to begin work on the rail lines that will enable innovative tram trains to run between Sheffield, Rotherham and Parkgate. The already delayed pilot project, first mentioned in 2009, is now set to begin in 2017, running vehicles on both rail and tram networks, using the freight route from Rotherham and then joining the Sheffield Supertram network at Meadowhall South. With funding from the Government, the £60m pilot scheme is set to run for two years with a view to permanent operation. It is the first of its kind in the UK and if it is successful, it opens the way for tram trains to be introduced in other parts of the country. Last year, transport leaders in the Sheffield city region were forced to write to the Transport Secretary to express some concerns about the delays to the project and to seek a way to resolve them. 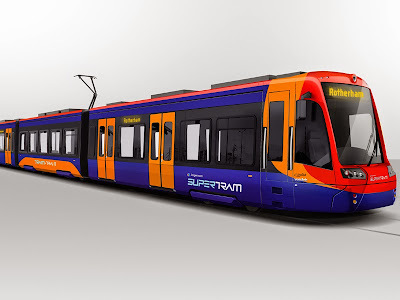 Network Rail has completed consultations with local residents, landowners, rail and tram passengers on the construction plans for 150 metres of track at Tinsley to connect the Supertram and railway networks. A decision from the Secretary of State on granting the necessary powers to construct and operate a chord at Tinsley is expected this month. But Network Rail is still getting to grips with some of heavy rail modifications, including power, track modifications, approvals and testing and commissioning. It has meant that projected costs have increased and services are an estimated 18 months away. Transport bosses have also been frustrated by the delays in updates from Network Rail and revised spend profiles. The issues on the delays to the project were discussed at a recent meeting of the Sheffield City Region Combined Authority Transport Committee. South Yorkshire Passenger Transport Executive (SYPTE) is a partner in the project alongside Network Rail, Department for Transport (DfT), Northern Rail and Stagecoach Supertram. David Young, interim director general at SYPTE, said at the meeting: "There is considerable dialogue between Network Rail and the DfT because the contractual arrangement is between those two parties - has the DfT got the funding and can Network Rail bring forward a deliverable scheme with the funding available? - that is the challenge. "The trams themselves are being bought by the South Yorkshire PTE from funding provided by the Department for Transport. We are procuring seven tram train vehicles. Three for the pilot out to Rotherham Parkgate and three to provide additional capacity on the tram system. Each of those three trams needed to have a spare but because we brought the two projects together, instead of having two spares, we only need one spare." The vehicles are currently being manufactured in Spain. The first body shell has been completed and is now ready for testing and the second is in progress. The first of the vehicles is programmed for delivery to Sheffield in November 2015 for final testing and commissioning. There is a danger that the new vehicles could be sat at the Nunnery depot with the warranty running out whilst Network Rail completes work to its lines. Young added: "When four have been delivered, the maintenance period starts. We are in discussion with the Department for Transport about the implications of that because experience tells us that we need to utilise those vehicles to ensure that they continue to work properly and get any teething problems sorted. Going into cold storage with new kit is never a wise thing. "Maintenance warranties only apply to their use on the tram system and so the tram train crossover and use on the heavy rail system is an area where we want to take advantage of the full warranty period." Delays on Network Rail projects have been encountered before in Rotherham. The £8.5m redeveloped Rotherham Central Station was officially reopened in Rotherham town centre in July 2012. Contractors, Galliford Try were initially set to complete the development by Christmas 2010. Young concluded: "If you read the papers and listen to other projects that are going on on the heavy rail network, the difficulty with the timeliness of delivery by Network Rail, and the accuracy of their budgeting, is a widespread problem and there's nothing unique to this project. I think its something more endemic in Network Rail as a whole and something the industry needs to fully get hold of. "I think it is an issue we need to keep close sight on and we saw an early sight of that with the behaviours at Rotherham Central Station."